On Wednesday, Tennis Canada announced the names of the players who have received a wildcard into the 2018 Rogers Cup presented by National Bank in Montreal and Toronto. The last two wildcards for the WTA Premier 5 tournament in Montreal were awarded to Canadians Bianca Andreescu (Mississauga, ON) and Carol Zhao (Richmond Hill, ON). On the men’s side, Félix Auger-Aliassime (Montreal, QC), Peter Polansky (Thornhill, ON) and Vasek Pospisil (Vancouver, BC) were invited into the main draw in Toronto. And so, Canada will be represented by eight players in the two cities. Auger-Aliassime, Polansky and Pospisil join their countrymen Milos Raonic (Thornhill, ON) and Denis Shapovalov (Richmond Hill, ON), and Andreescu and Zhao meet up with Eugenie Bouchard (Montreal, QC), whose wildcard was confirmed earlier this month. Auger-Aliassime will play in the main draw of Rogers Cup for the very first time. Last year, he was forced to skip the event due to injury. The Montrealer earned his first ATP win in March when he defeated fellow Canadian Vasek Pospisil before falling to Milos Raonic in the second round at Indian Wells. He recently defended his crown at the Lyon Challenger. In doing so, he earned his third Challenger title at the age of 17, becoming a member of a select group of players that includes Novak Djokovic and Juan Martin del Potro. Auger-Aliassime is currently ranked World No. 134—a high in his young career. For Pospisil, the tournament will be his eighth Rogers Cup. In 2013, he took John Isner and Tomas Berdych by surprise on his way to an all-Canadian semi against Milos Raonic. It was a homegrown matchup that hadn’t been seen since 1990. Pospisil reached the quarterfinals in Newport last week and appeared in two straight ATP Challenger finals in South Korea in May. He got his season off to a great start with wins at the Challenger events in Rennes and Budapest. Polansky is coming off an excellent week that culminated in him hoisting the winner’s trophy of the Granby National Bank Challenger. Currently ranked World No. 122, the 30-year-old qualified for the first three Grand Slam tournaments of the season. He will be making his 11th appearance in the main draw of Rogers Cup. Last year in Montréal, he got the better of Pospisil but was no match for Roger Federer. Canadian no.2 and World No. 138 Carol Zhao will play in the main draw of Rogers Cup for the third time in her career and fight to make it past round 1 for the very first time. Earlier this season, she reached the quarterfinals of the Midland Challenger and joined Canada’s Fed Cup team in its first-round World Group II showdown against Romania. Andreescu went as far as the semifinals of the Granby Challenger last week before being stopped in her tracks by a back injury. She withdrew from the tournament in Washington this week to recover for Rogers Cup. This season, the 18-year-old battled in two Challenger finals in Japan in March. Currently ranked World No. 148, she is in the main draw of Rogers Cup for a second consecutive season. The wildcards for the qualifying event were also announced. In Montréal, they were awarded to Françoise Abanda (Montreal, QC), Rebecca Marino (Vancouver, BC) and Katherine Sebov (Toronto, ON). An additional spot is also reserved for the winner of a prequalifying tournament that is underway this week at IGA Stadium. The last two wildcards for the qualifying rounds were exchanged for main draw slots in Hobart in early 2018 and Miami in 2019. In Toronto, three-time Grand Slam champion Stan Wawrinka, who is currently ranked World No. 201 in the wake of two knee surgeries, has gotten a wildcard along with Filip Peliwo (Vancouver, BC) and Brayden Schnur (Pickering, ON). A fourth wildcard will be handed out later this week. In doubles, two all-Canadian teams received Wild Cards for the main draw. Daniel Nestor (Toronto, ON) will take part in his final Rogers Cup playing alongside Vasek Pospisil, while Félix Auger-Aliassime and Denis Shapovalov will team up and try to cause some surprises. The doubles Wild Cards for Montreal will be announced in the coming days. Owned and operated by Tennis Canada, the prestigious Rogers Cup presented by National Bank attracts the biggest stars in tennis year after year. In 2018, the men’s event will take place at the Aviva Centre in Toronto from August 4 to 12, while the women’s event will take place at IGA Stadium in Montreal from August 3 to 12. 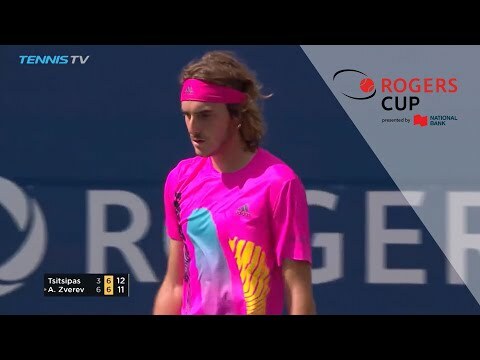 Sportsnet is the official English broadcaster and TVA Sports is the official French broadcaster of the 2018 Rogers Cup.